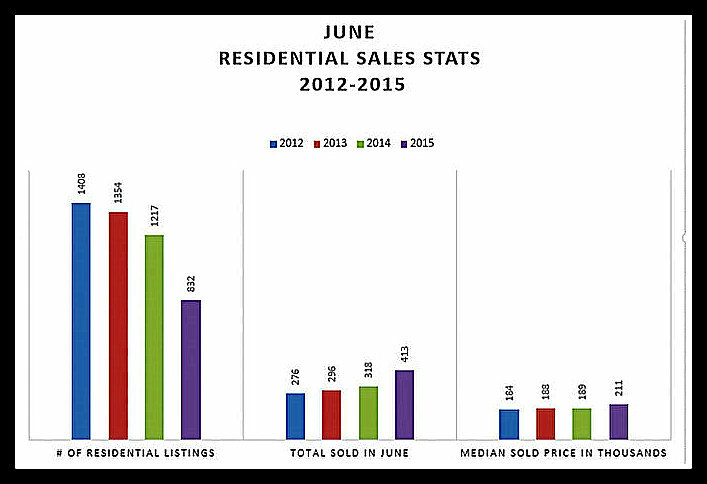 June statistics are in for the Tri-Cities Association of Realtors. June is an important month because it’s halfway through the year, past the spring rush, and before the slowdown that sometimes occurs in the winter. Home sales tend to be at a consistent level and depict the speed of the market. Realtors, buyers, and sellers know that the market is moving fast–but how fast compared to recent years? # of Listings: The first set of columns shows the # of residential listings in the Tri-Cities. The current number of listings is 832, which is a huge drop from the previous year’s 1217 listings. So basically when driving around town, there will be 1/3 fewer “for sale” signs compared to last year, and 1/3 fewer options for buyers looking to purchase a new home. Total Sales: The 2nd set of colums show total # of sales that closed in June in the Tri-Cities. There were 413 homes that closed this June, up almost 100 homes from the previous year! This is the largest leap we’ve seen in many years. Median Price: The final set of columns show the median price of homes that have sold in the Tri-Cities in June. We are lucky to live in an area with a slow and steady increase in home values. For the past few years, the median price has increased by $1000-$4000 each year. This year there was a $22,000 jump in median price! This means home values are increasing and sellers are able to ask more for their homes than they would have in the past. When pricing a home, it’s important to work with an agent who knows the current home values. If you’d like more information about the current market value for you home or neighborhood, please give Nick or Valerie a call at (509)845-4570.